From the moment I was born, I’ve been treated as a girl. But it wasn’t until I was eight years old that I found out that I was white. For me, feminism has always felt innate. It’s always been a part of me, my identity, and my worldview. I was gendered female upon arrival here, and my experiences time and again have demonstrated how important my sense of feminism is. Growing up, I experienced a battle between my body and a defiance of sexist beauty standards. I learned about the importance of being valued by men as well as the danger of men. I learned about violence against women and experienced the violence of men. I read history books written by men, and my insecurities edged me out of male-dominated sports and fields of study. I continuously grappled with internalized misogyny. My assigned female body, my femininity, and my feminism – they are present in my every breath. But I did not realize I was white until I was eight years old. I knew that people of color existed, sure. But raised in a white, racially homogenous town, I was surrounded by others who looked like me and was intentionally protected from seeing racism. My whiteness was a “non-issue,” and so it wasn’t real. Then, in the summer after third grade, my mom sent me to a girls’ empowerment camp in Cleveland in which I was the only white kid. I remember walking in to find a circle filled with black girls and noting, for the first time in my life, my whiteness. For the girls at camp, their race was a source of pride and their experiences with racism a source of fight built into their every breath. As my mom had taught me about being a girl, their moms had taught them about being black girls. I began to tremble a bit as it came to my turn. I can’t say I’m proud to be black because I’m not black. But I’m white? What does that mean? I’m not proud of that…I don’t think? “Hi, I’m Kelly, I’m proud I’m a girl, and I’m proud I have a guinea pig.” Well, that was that. Part of my white privilege was not seeing my whiteness. One of the most pervasive tools of oppression is the insistence that power and privilege do not exist. From birth, those of us with privileged identities are socialized to internalize dominance. We come to believe that our privilege, or even superiority, is natural, and that all opportunities are granted based on individual merit. Internalized dominance is the fuel with which the oppression monster feeds itself. If men don’t acknowledge that they benefit from sexism, gender inequity remains status quo. And if white people don’t acknowledge that they benefit from racism, they are cosigning onto white supremacy. Many of us carry internalized dominance in some form or another – as white folks, as cismen, as straight folks, as able-bodied folks, as United States citizens. And because of the often-subconscious nature of internalized dominance, our social justice learning curve typically entails unlearning. For example: For a gay man to stand in solidarity with a lesbian woman — with whom he shares a marginalized sexuality, but carries a dominant gender — he must unlearn his internalized sexism. Otherwise, his male privilege will inevitably show up – despite his efforts to combat homophobia alongside her. If it so happens he is white (carrying a dominant race), and she is black (a marginalized race), he must also unlearn his internalized white supremacy. Otherwise, his internalized sexism and racism begin to layer in how he moves through the world. But it gets… tangled. As systems of oppression are. To stand firmly in anti-racism, white feminists must unlearn internalized white supremacy. The unlearning of white supremacy isn’t exactly encouraged by the existing powers that be. Unfortunately, it’s not an integral rite of feminist passage. Dismantling white supremacy isn’t a core element of high school social studies, nor a given in women’s studies curricula. Because of this, internalized white supremacy among feminism carries a long and painful history that continues to create fierce divisions today. In 1982, a group of black lesbian feminists by the name of the Combahee River Collective issued a statement that would become a core canon of black feminist thought and a required text within intersectional feminism. We repeatedly hear the voices of feminists of color calling out a persistent whitewashed feminism that erases their experiences as people of color. This is not new. This has been going on for over a century. So where are the white anti-racist feminists? Because of internalized dominance, being marginalized in one way doesn’t necessarily translate to honoring the marginalized experience of those who are different from you. More simply: Identifying with feminism doesn’t mean that I don’t perpetuate white supremacy — and the same goes for you. Consider this: As a feminist, how many times have you heard the following? Maybe if women didn’t dress like that, they wouldn’t get sexually assaulted. That’s reverse sexism. You’re just a man hater. It’s not all about gender, you know. Women are sexist toward each other, too. Why don’t you ever talk about men’s issues? Men are victims to violence, too. I can’t be sexist. I’m a [marginalized identity]. You’re just dividing people. Why are you so angry? I imagine you’ve heard at least one of those things before, if not all. How did you respond? How did you feel? As an anti-racist feminist, how many times have you heard the following? Maybe if people of color didn’t commit crimes, they wouldn’t get arrested. That’s reverse racism. It sounds like you just hate white people. It’s not all about race, you know. People of color are racist toward each other, too. Why don’t you ever talk about the struggles white people face? White people are arrested, too. I can’t be racist. I’m a woman. You’re just dividing feminists. Why are you so angry? Similarly, I imagine you’ve heard at least one of those things before, if not all. How did you respond? How did you feel? One marginalized identity does not immunize us from internalizing the dominance of another. Without unlearning internalized dominance, white feminists can silence the experiences of people of color just as men can silence the experiences of women. Many anti-racist feminists rightfully mistrust an anti-racism that is outward looking – the type that believes that as a white feminist, I should learn about the experiences of people of color in order to help them. I should promote diversity and inclusion. Instead, as a white feminist, I need to first study my white privilege, unlearn my internalized white supremacy, and emotionally connect to the ways in which I perpetuate oppression. In sum: I had those eight free years of color-ignorance, but it’s time I learned about my whiteness. When I commit to self-awareness, it’s not very hard to identify the ways in which my whiteness shows up in the world. For example, I can emotionally connect to many times when men have spoken over me. Examining my whiteness, I can also map that emotional experience onto times when I have spoken over people of color. I can emotionally connect to reading disparaging statistics about communities I belong to and wishing our strengths were publicized instead. Examining my whiteness, I can also map that emotional experience onto a time when I read disparaging statistics about a community of color and attributed those statistics to the community itself. I can emotionally connect to being called angry and polarizing for speaking up around gender and cissexism. Examining my whiteness, I can also map that emotional experience onto a time where I felt a person of color was being oppositional around race and racism. I don’t feel proud of my whiteness, no. But I have to acknowledge my oppression and my capacity to oppress if I want to inhabit a feminism that truly dismantles not just my oppression, but also the whole thorny system of oppression. What this means is that my accountability to anti-racism as a white person is as integral to my feminism as gender itself is. Sometimes more so given the work of unlearning I must continue to do. If you have come here to help me, you are wasting our time. But if you have come because your liberation is bound up with mine, then let us work together. 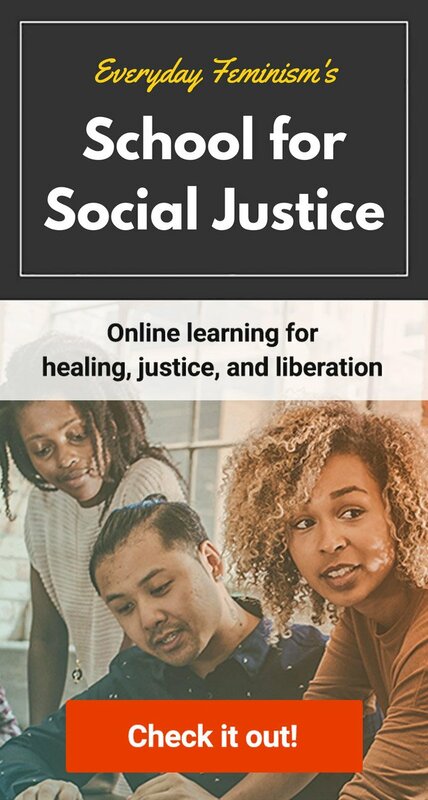 Only when we unlearn our internalized power and privilege do we emotionally connect to the shape-shifting web of oppression and find our unique role in dismantling it. For white feminists, we are well overdue to place a collective emphasis on noticing and learning about our whiteness as it relates to our desire to be anti-racist. This isn’t just a call to learn about the unique struggles encountered by women of color in a white supremacist society, but to really study your whiteness. This is the only way to genuinely address white privilege in a way that lends itself to a humble and focused anti-racism. Study your words, your thoughts, your feels. Find what is yours and what you have been taught. Examine the things that you feel entitled to, or situations in which you do not experience barriers. And when you find your privilege is checked, or witness another responding to their privilege being checked, notice the response. Specifically, have an honest conversation with your heart and witness whether you experience the silencing tools of oppression — not only the ones that erase the lives of women, but also the lives of people of color. 1. Systems of oppression aren’t real. It’s the individual person’s fault. 2. You’re making me feel badly about systems of oppression, so I’m the oppressed. That’s reverse sexism: you’re just a man hater. That’s reverse racism: it sounds like you just hate white people. 3. Internalized oppression justifies systems of oppression because the oppressed participate. 4. Hurtful experiences happen to everyone. 5. I’m oppressed myself, so I can’t hold any privileged identities. 6. You’re making things up because you’re cranky. 7. There are good individuals, and we should focus on that. I imagine you’ve heard at least one of those things before, if not all. Maybe you thought it. Maybe you said it. And maybe it’s time to probe a bit deeper.